Thomas Brassey was the greatest railway builder in the world and a colossus of Victorian enterprise who has become, perhaps, the most unsung hero of his age. 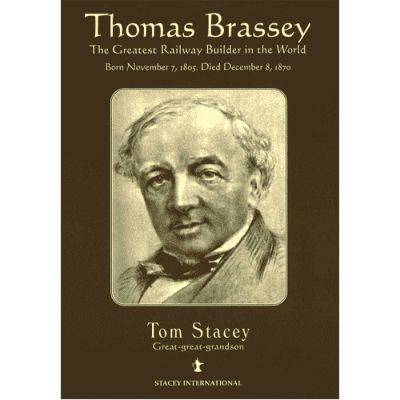 For some 30 years up to his death in 1870, Brassey was employing an average of 80,000 men on as many as a dozen railway projects simultaneously, in up to four continents. Brassey was a supreme exemplar of that workmanship, ingenuity, daring and commercial probity which built England s reputation all around the world for the next one hundred years. He was revered by his workforce, whom he in turn nurtured and treasured. Thomas Brassey, the Greatest Railway Builder in the World sets Brassy s achievements in the context of Britain s expanding worldwide role in the 19th century, and penetrates the character and qualities of a figure who surely deserves to be as famous and honored as his friend and occasional colleague I K Brunel.